There are not many places on this earth that evoke more emotion amongst Pagans, Wiccans, Druids and Witches than Stonehenge. It has become a place to gather on the Solstices, and other sacred holidays. It is a place of healing, a place of powerful energies. 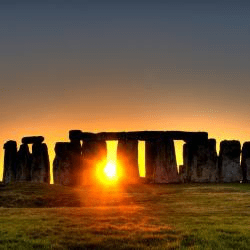 Several thousand gather on the Summer Solstice annually to watch the sunrise through the stones. It has become a place of pilgrimage for many. Theories abound as to who built it and why. How was it built, considering that the bluestones come from 250 miles away in South Wales, and the upright stones are 7 feet tall, weigh 50 tons each and come from 20 miles away in Marlboroughdowns? We may never know the exact origins of Stonehenge, but there are things that we do know. just north of the Stonehenge location, a causeway enclosure is built with several long barrows in 3000 BCE. In 2500 BCE, stones are raised in the center using the larger sarcen stones in two circular arrangements with smaller bluestones in between them, followed by the central bluestones being arranged in a circle and inner oval in 2300-2200 BCE. Throughout the years from 1800 BCE to 1500 BCE, pits are dug, sarcens are decorated with axe heads and daggers. 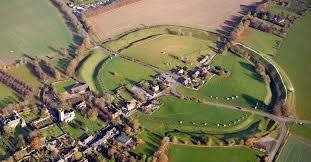 The land that Stonehenge sits upon was owned by Sir Edmund Antrobos, who sells it to Cecil Chubb, who gives it to Britain. No one is sure if all of the building was done by the same tribe of peoples who lived there or if different tribes of people built on to what was previously there. It is agreed that the temple was built to align with the movements of the sun. From the Heel Stone in the northeast of the circle, looking within, you can see the sun rise in the direction of the Heel Stone. One folktale surrounding Stonehenge is that Giants brought healing stones called the Giant’s Dance from Africa to Ireland. King Aurelius Ambrosius (he of the hur tale) wanted to make a memorial to the slain from one of the many battles with the Saxons. He chose the Giant’s Dance in Ireland and sent his many knights to Ireland to move it to England, but to no avail — the stones could not be budged. Coming to the rescue was the Wizard Merlin, who easily brought them to England where Stonehenge was dedicated. Some say he sang the stones across the sea from Ireland. Singing also plays a part in the story that the survivors of Atlantis built Stonehenge, singing the stones into place, which I believe is a lovely tale. That Stonehenge was, and is, considered a place of healing would account for the more than 350 burial mounds found there so far. Was it built just as a burial place, or was it more than that? It is apparent that the ancient peoples of Britain considered this monumental temple to be an important part of their spiritual and religious lives. 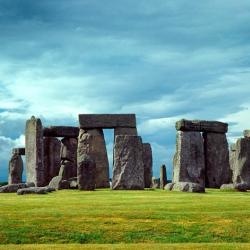 What it was exactly has been lost in time; however, Stonehenge once again became a place of spirit in the 20th century. In August of 1905, the Ancient Order of Druids used Stonehenge as the place of a mass initiation, bringing 259 new members into their order. This, apparently, was the beginning of bringing Stonehenge back to the attention of Pagans and Witches. As was mentioned earlier, several thousand gather annually at Stonehenge for the Summer Solstice. The truly awful part is that they leave this sacred place a mess, as you can see. As one of those who revere the earth as the Goddess, this brings a great sadness to me, and those who attended, who call themselves Pagan and children of the earth should be ashamed, as this would be a perfect opportunity to show others what Pagans believe and how we care for Mother Earth. 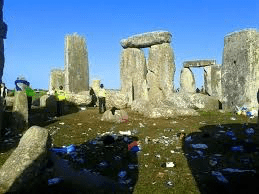 Stonehenge is not the only sacred place on the Salisbury Plain. 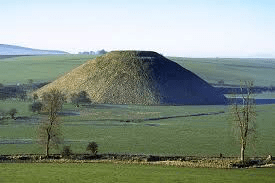 Sillbury Hill – This is the tallest Neolithic structure in Europe. It is believed to be built around 2700 BCE. It was thought that people used these mounds to reach up and touch heaven. 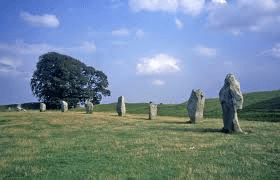 Stone Circle of Avebury – You can still come here to celebrate the old Pagan festivals, although on a much smaller and quieter scale – sounds lovely! 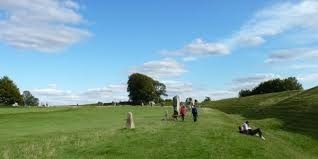 If you walk through an avenue of stones from the ritual circle, you will come to The Hilltop and The Sanctuary. There is also Woodhenge one and half miles away. It is thought that Woodhenge was built around the same time(s) as Stonehenge. It is unfortunate that all that remains are stumps. These are just a few of the Sacred Spaces and Sacred Places in Great Britain, and England, specifically. There are many more throughout the English countryside and into Ireland and Scotland. Speaking only for myself, they are all on my bucket list. May you all have your special spiritual places in which to feel relaxed, renewed and rejuvenated.